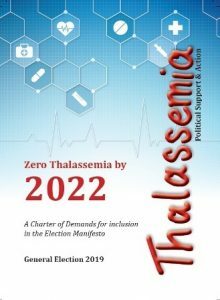 A Charter of 10-points demands to achieve Zero Thalassemia by 2022 for inclusion in the election manifesto of all political parties in India will be launched soon. Underlining the significance of political manifestos and how they can help voters including first-timers to zero-in on their candidate of choice was Delhi Chief Electoral Officer Dr. Ranbir Singh at an event held by Josh Talks at Dr. Ambedkar International Centre, Delhi last month. The point holds ground considering that a manifesto is a ‘public disclosure of aims and policy of a candidate or a political party’ that sets the agenda. Ahead of the 2019 General Elections, activists, Thalassemics and organisations working to raise awareness against the blood disorder have joined hands to urge political parties to include a 10-point demand in their manifestos to achieve Zero Thalassemia by 2022. “In the run up to the General Election 2019, we concerned citizens, parents and patients hereby request all political parties to consider the inclusion of 10-point demands in the respective party manifestos for India to achieve Zero Thalassemia by 2022. This is achievable and we look forward to India becoming free of Thalassemia in the years to come,” reads the 8-page charter to be launched soon. As an inherited disorder from at least one of the parent, Thalassemia is caused by either a ‘genetic mutation or a deletion of certain key gene fragments’. While Thalassemia minor is a less serious form of the disorder, Thalassemia major results in excessive destruction of red blood cells, which leads to anaemia where the body doesn’t have enough healthy red blood cells. To survive, one needs to get blood transfusions every two-three weeks for the entire life span. These prolonged blood transfusions and other treatments give rise to complications needing periodic regular medical monitoring of serum ferritin (iron overload level) and, functioning of organs like liver, spleen, heart, etc. There is also risk of infections like HIV, Hepatitis B and C etc. Thus, a life-long comprehensive Thalassemia care programme is required for the child to lead a near normal life. Brought out by Amit Iyer Memorial Foundation, Mumbai, Sankalp India Foundation, Bengaluru, Centre for Legislative Research and Advocacy (CLRA), New Delhi, WE CARE Trust, Mumbai and Jalaram Abhyuday Sadbhavna Trust, Ahmedabad, the charter urges that for a Thalassemia-Free India, ‘an effective prevention programme should include a wide public awareness campaign by using various media so that every woman is empowered to ask for a Thalassemia screening test at her first pregnancy’. The charter also demands a legal mandate for gynecologists to test every woman at the first pregnancy. With a population of 1.3 billion people and about four per cent of them being Thalassemia minors, India has the highest number of Thalassemics in the world. A huge 50 million people are at risk but oblivious to the possibility of facing a distressing situation when they marry and start a family. The charter also calls for Thalassemia to be declared as a National Public Health Challenge by the Government and demands for creation of a national register of Thalassemia majors, Thalassemia minors, and a technology-based system to collect and collate virtual and real-time data on Thalassemia. It also states training to be ensured for all gynecologists, nursing staff and other paramedics in order to implement the legal mandate of Thalassemia screening test. The charter also urges that ‘the public healthcare system should include free of cost facilities for Thalassemia screening test, offer comprehensive (one-stop) care right from blood transfusion to giving chelation medicines to periodical monitoring of all related parameters at the level of each District Health facility. Considering the continuous need of blood transfusions and other treatments, the charter further states that Thalassemia major children and adults should be encouraged to pursue education and careers without discrimination – ‘not only top-class comprehensive care facilities but also extending travel concessions, rebate in school/college fees, etc’. Since presently the only cure available for existing Thalassemia major population is Bone Marrow Transplant (BMT), only a fraction of them are able to access as they need HLA or Human Leukocyte Antigens which are proteins found on most cells of the body that help recognise which cells belong to the body and which do not. This simply means that without a matching donor, such a marrow transplant can’t take place. Despite the fact that there are many centres in the country where BMT is available, affordability becomes prohibitive as the cost of such a transplant ranges from Rs.9 to Rs.20 lakh. Therefore, the charter demands that ‘one or two BMT centres in every State should subsidise the cost of BMT to make it absolutely free’.